The Zebra Loach is a handsome shoaling fish that makes a lively addition to an aquarium! The Zebra Loach Botia striata is a lively and attractively patterned fish. At first sight this loach appears to have lots of vertical bands, but basically it has about nine (very broad) dark bluish-green bands set on a yellowish green body. The bands have whitish lines inside that are generally straight, but sometimes can be broken or branched. These white lines lend to the many striped appearance. Due to its distinctive appearance it is also called a Candy-stripe Loach, Striped Loach, Candy Loach, and Thin Line Loach. These are hardy, smaller sized loaches that can make a great choice for the beginner. They are not overly picky about foods and have no special demands on water conditions. As juveniles they will eat just about anything that is edible, though as adults they can get a bit more finicky. They are naturally nocturnal, but once they've become acclimated they will spend a good deal of time out and about during the day. They enjoy a planted tank with open areas to swim and places to hide or retreat to among rocks or wood. These are some of the more peaceful Botias. Yet they are active fish that like to frolic with the company of their own kind as well as other non-aggressive loaches. They do best in a school of five or more, and can become withdrawn or more aggressive if kept singly. Keeping them in a pair or a smaller group of three are also not good choices. In groups that are too small, the dominant fish will get very aggressive towards the other, constantly harassing them and keeping them from feeding. Though generally quite peaceful with their tank mates Zebra Loaches have been known to nip occasionally, usually it is just among themselves. They will also munch on snails and are good for snail control. The Zebra Loach is a very long lived, durable, and undemanding fish. The Zebra Loach Botia striata was described by Narayan Rao in 1920. They are found from Mysore in southern India which goes through the Western Ghats mountain range. This species is listed on the IUCN Red List as Endangered (EN) because it has a very limited range and are found in only four fragmented locations within that range. There has been severe habitat destruction from deforestation to recreation that are impacting and polluting its environment. Other common names it is known by are Candy-stripe Loach, Striped Loach, Thinline Loach, Striata Botia Loach, Thinline Loach, and Candystripe Loach. It is found in northern India in the streams and rivers of Bangladesh. Their normal habitat is slow to moderate flowing waters depending on the season. The substrate is normally made up of bedrock, boulders, gravel, sand and leaf litter and the habitat is usually shaded by the forests canopy. 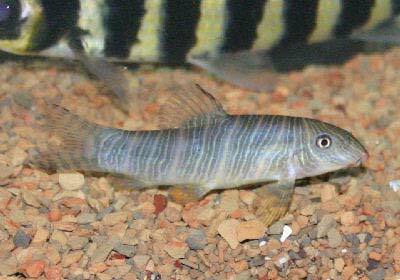 In nature these loaches are mainly carnivorous, but will consume plant matter if available. The Zebra Loach is a smaller loach that can reach from 3 - 4 inches (7.8 - 10 cm), though often a bit smaller in the aquarium.. Their life span is generally about 5 - 8 years, though they been reported to live for 15 or more years. This loach has a yellowish green body with about nine (very broad) dark bluish-green bands. These bands have whitish lines inside that are generally straight, but sometimes can be broken or branched. Its fins and tail are translucent with the tail having bands of brown spots. There are four pairs of barbels by the mouth. Size of fish - inches: 3.9 inches (10.01 cm) - These fish can reach from 3 - 4 inches (7.8 - 10 cm), though often a bit smaller in the aquarium. Lifespan: 8 years - This fish generally has a lifespan of about 5 - 8 years, but has also been reported to live up to 15 or more years. Since they are omnivorous, the Zebra Loach is not a picky eater and will generally eat all kinds of live foods, sinking pelleted and tablet foods, flakes, and algae. They like frozen foods as well. To keep a good balance give them a high quality flake or tablet food everyday. Feed mosquito larvae and brine shrimp (either live or frozen), tubifex, daphnia, and some vegetable foods such as algae wafers. They will also eat snails, so are good for snail control. The Zebra Loach will swim mostly on the bottom of the aquarium, but will also swim in the middle of the aquarium. Never introduce this loach into a biological immature setup as these fish require pristine water. Because these fish do best in groups, a larger tank of at least 30 gallons will work best. They do best in soft, slightly acidic water with subdued lighting. They also need good water movement that provides plenty of oxygenation. The tank water should turnover at least 10-15 times per hour. An undergravel filter is a great choice for these fish as it creates high oxygen through out the tank as well as reducing the waste. Adding a canister filter or power head to the setup will make the proper current for this loach. It is recommended to have a tank set-up that resembles its natural habitat with plants, open areas to swim, and places for retreat. The substrate needs to be a fine smooth gravel or sand that does not have sharp edges. The tank needs to have ample hiding places for this shy fish such as rocks, caves, and roots. These loaches are very inquisitive and like to explore so make sure to have a lot of caves and crevices. These fish can and will jump out of the tank if given the chance so make sure to have a tight fitting cover. A good community fish, they get along well with other loaches and tank mates that are non-aggressive. They enjoy the company of their own species and it is recommended that they be kept in small groups of at least 5 of its own kind. They are quite active and have been reported to occasionally nip the fins of their tank mates, though usually their squabbling is just between themselves. They are naturally nocturnal but will become quite active during the day once they become acclimated. Good for snail control! Lively and fun to watch. Same species - conspecifics: Yes - Best kept in groups of 5 or more. Slow Swimmers & Eaters (): Monitor - Will nip at slow swimming long-finned fish. Unknown though a gravid female will be rounder. Not much is known about the breeding habits of the Zebra Loach and they are not yet bred commercially. An outbreak of disease can often be limited to just one or a few fishes if you deal with it at an early stage. When keeping these sensitive types of fish, it is common to catch deteriorating water conditions and disease before other fish are affected. The best way to proactively prevent disease is to give your Zebra Loach the proper environment and give them a well balanced diet. The closer to their natural habitat the less stress the fish will have, making them healthier and happy. A stressed fish will is more likely to acquire disease. The Zebra Loach is usually readily available at pet stores and online. I have bought 2 Zebra Loaches to control an outbreak of snails in my tank,this job was done very quickly and now swim very lively around the 33 gal tank with very little hiding.Just the other day my 13 year old said there is something strange about 1 of the Zebras and upon inspection it seems as thou the fish is pregnant with a swollen mid section.Can anyone give me any kind of info to work with if this is the case. I have the same question. I have 5 zebra loaches. They all used to be the same size, but now after 2 years one of them is visibly larger especially along the belly. I think it's a female and she's eggbearing, but most sites I've seen say that loaches don't tend to spawn in captivity. They're with a lot of other types of fish (danios, harlequins, pristellas, cherry barbs, 2 angels and some electric yellow cichlids) in a 215L tank. The substrate is 5-10mm stones, but there's rocks, lots of driftwood, and some fake plants in there too. If she did lay eggs where would she prefer? I have a pair of cichlids they are long snake looking with black and yellow stripes. They are now breeding, already produced seven babies growing well. The mother is always hiding under gravel. Seems like she is producing more eggs, what can I expect in the future? The male chases her she seldom comes out with the other cichlids in a large l00 gallon tank. This has nothing to do with zebra loaches and should be posted on a cichlid forum. What is the typer of fish in the background of this picture? The fish in the background is a Banded Leporinus (Leporinus fasciatus), also called the Black-Banded Leporinus. I just purchased a loach about a week ago, the first day he/she pretty much stayed to itself and in one place. I woke up the next morning and realized the loach had made its way into the mouth of a fake alligator (Open on both ends). To the best of my knowledge the loach has not moved from that spot, unless he/she is coming out @ night or when I'm gone. Is this normal or should I be worried and do something? Thanks for any help in advance. Nothing to worry about. They like to hide and probably coming out at night. Fish and loaches are curious creatures. If you give them plenty of hiding places they will feel more secure and eventually start to swim around becoming the real characters of your aquarium. But give them no hiding places and they will pine away. Be careful with plastic caves and ornaments. If they can get stuck in them they will. Bog wood and plants are preferred. My loaches (have around 20) are getting on for 10 years old.